Yesterday I was in Yoga with my favorite yogie, (Annie Bolton of Yoga on Davidson) and like always, she started class with a quote to help us set our intentions. These are always enlightening and put me in a positive state of mind but this particular passage sent my mind down a different path than usual. 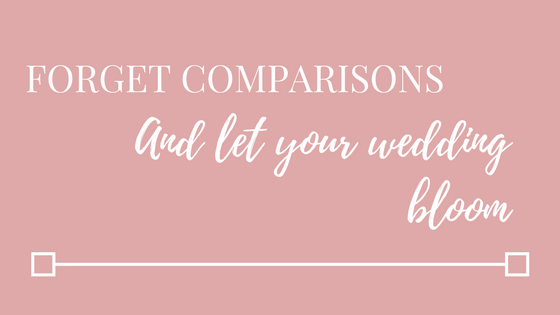 But if you happen to fall into the camp that most of us seem to land where we find ourselves constantly competing and comparing what we have and what we want, to that of our friends, to every single pin on Pinterest or to every social media post that we see, this blog is for you. First let me say that I am totally in the camp of drooling over pretty Instagram accounts and some days I fall down a rabbit hole where I am pinning 4 million plus pins. As a visual person, it is crazy hard for me not to see something beautiful and either want it or want to create something as visually pleasing…Clothes, Home Decor, Hair Styles….I am looking at you! This is hard enough just on your average day but you throw in being engaged and trying to plan a wedding on top of that. It is hard not to size ourselves up and try to compete with all the pretty things and ideas in the world. However, there are a couple of big problems with this phenomenon so I want to talk about what those are and how to try and avoid them so that your wedding can bloom into a beautiful day on its own. 1. Trying Too Hard To Compete Creates A Potentially Unattainable Idea of How Your Day Will Look. This is a pretty general and broad statement but I think it is something that all brides should be aware of. 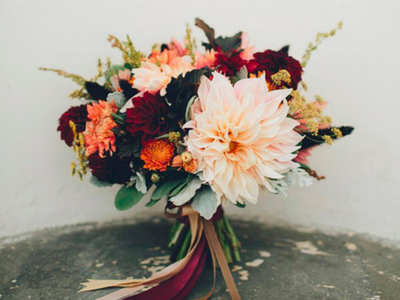 Many times when you see these gorgeous photos on Instagram or Pinterest that you save to your “Dream Wedding Board” they are from styled shoots. A styled shoot means that someone is working together with a team of awesome vendors who all have talents from across the industry to provide the picture perfect setting to showcase their talents. I have heard of teams renting out warehouses and styling photos for 4 plus days to get some of these shots. While this is great for creating inspiration for us and for promoting the amazing talent that is out there, it also creates this idea that you too will have that look. The majority of us do not have endless budgets to throw around for our wedding day so when we start adding up what we can afford, somehow it seems to diminish the beauty of the day because we can’t recreate that perfect image we have built up in our minds. While learning from others is important, trying to keep up with the Jones’ can be debilitating to us too! got married, I had looks from vineyard weddings to desert weddings and everything in between because I was pinning things that I thought were fun. It didn’t matter to me that it didn’t fit my venue, my style or my budget, they were pretty and of course I wanted a mini donkey in my photos with me! While I did tone it down and crossed the mini donkey off my list, there were still several things that I was trying to incorporate into my day that weren’t special to me, my husband or our unique love story. In the end, choosing to eliminate some of these things that were taken from someone else’s day, made our day more about us. When you are trying to recreate some of these looks, you may find that it is not as easy to put everything together to get a great finished product when you aren’t working with the experts. It should be noted that I am not discouraging DIY projects, but that you should go into your wedding planning with the awareness that things may not turn out like the photos you have seen. Or it doesn’t fit in with the feel of the day you are going for. At that point, you have spent time and money on something that you don’t end up using or can’t use. So how do we make sure that we are being like the flower that only cares about blooming for itself and fulfilling its own purpose? Start by trying to be intentional about your priorities for your wedding day. Before you start picking out color themes, defining guest lists, choosing dresses and narrowing down food choices, work out exactly what your main priorities are for the big day. If you go into your planning with a clear and decisive idea of what is important to the two of you, the less likely you will be to get caught up in the comparison game. Once you have your priorities set out, you can move on to your budget to get an idea of how you are going to be covering the costs that you will have. Defining your budget will allow you to know exactly what you can afford. Since your priorities are all set, it will also allow you to see areas where you can have a little more flexibility after you make sure the key items of your day are taken care of financially. At this point you can have a little more fun and start creating your vision boards. I recommend starting a brand new board on Pinterest where you can be deliberate as to what you are pinning. Choose to pin items that you truly have a purpose for and not just every pretty style that you see. 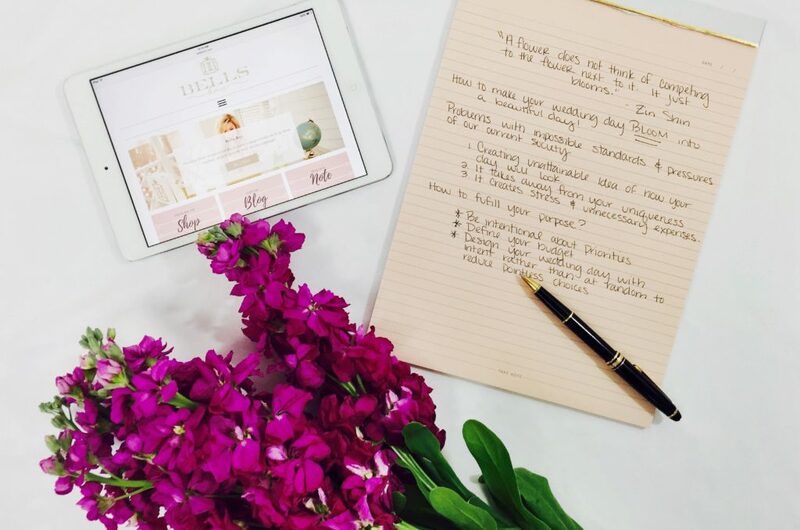 Designing our wedding days with intent rather than at random will reduce the choices that you have to make. And lastly know that you have the most important thing to help you bloom and that is the person waiting for you at the end of that aisle on your wedding day!